Spring has finally sprung! You know what that means, spring cleaning, organizing, and creating! One of the many reasons we are driven to spring clean is biological. As the sun starts to shine a little longer, humans are hardwired to be more active. With that increased activity comes the desire to cultivate your space and organize your life—also, your living room. Take a moment to look at your interior, really look at it. Is it in order, is it comfortable? Does it reflect you? Your home doesn’t have to be completely customized, but a personal touch can make all the difference. These do it yourself (DIY) decor projects are aesthetically pleasing and incredibly helpful; a win-win situation! Do you ever sit on your couch and wish you had a small ledge to balance food, a drink, your laptop, or maybe a book? Sometimes the coffee table is just too far away. This is why we recommend a laptop table. Believe it or not, a laptop table is essential for apartment life. With this DIY tutorial from House of Jade Interiors, making your own charming, tiny table is easier than ever. 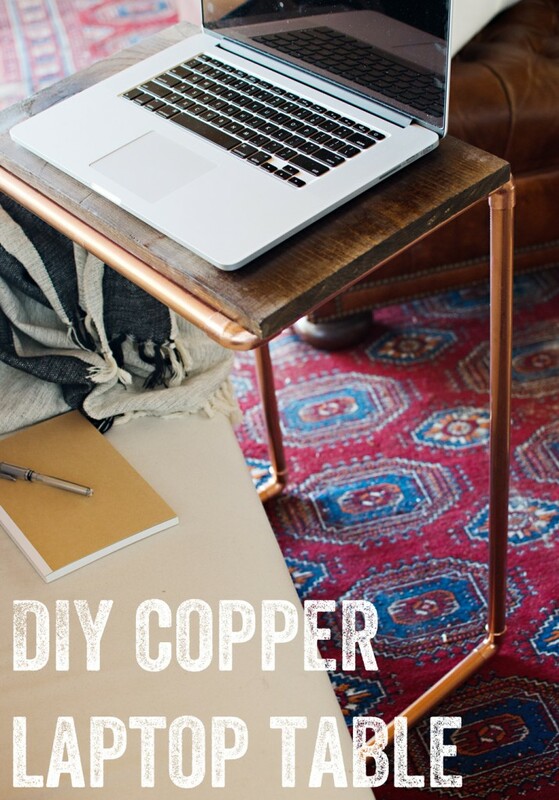 Though it looks intricate, this copper laptop ledge is easy to make. The hardest thing is waiting for the glue to set. All you need to make this is copper pipe, copper fittings, a pipe cutter, metal glue, scrap wood, and wood stain. All of these can be picked up at your closest Home Depot or Lowes. The table can be completed relatively quickly, it shouldn’t take more than 2-3 hours max; you’ll also spend most of that time waiting for glue to dry. All it takes is a few hours to create an adorable laptop table that’s trendy and functional. Does your bucket have a hole in it? Well, we don’t know how to patch that up, but you can use it as a mold for this stylish rope rope basket. Rope baskets are a timeless way to keep your apartment chic and organized. 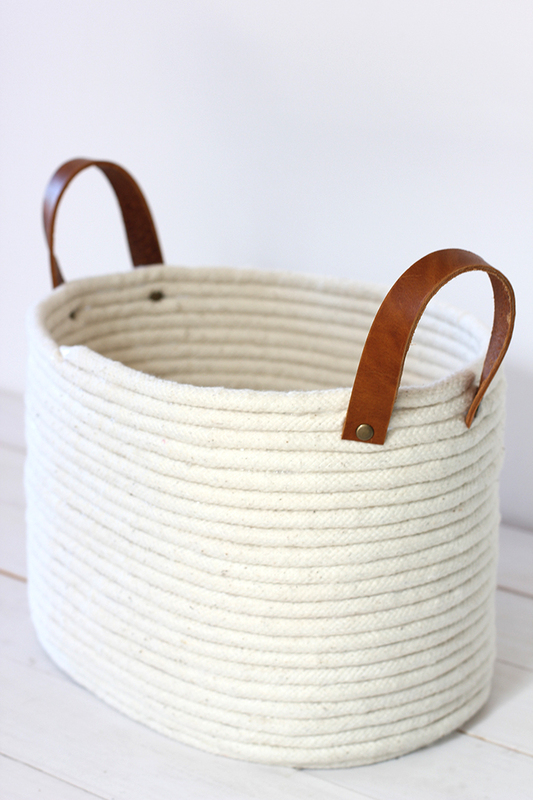 DIY Mavens, Alex & Lois, show how easy it is to make this rope coil basket. We use our baskets for anything; from spare blankets, to kids toys, to knitting projects, these baskets hold everything and look good doing it. Best part, it’s no-sew, which means easy peasy. All you need is some rope, a bucket, and a glue gun. For the full tutorial, check out the DIY site, Alex & Lois. Check your closest Michaels Arts & Crafts or Hobby Lobby for the supplies. Some patience will help too, but it’s not totally necessary. Worried about April showers? Gluing this rope basket is a perfect way to stay productive while chilling out in front of the TV. If you’re stuck inside because of rain, you now have something to show for it! Personal touches make your apartment truly feel like home. Though DIY may seem intimidating at first—cutting pipe, we know—they’re truly easy and a fun way to add some unique charm to your living space. Do you have any projects you’re planning or want to show off? Let us know in the comments!